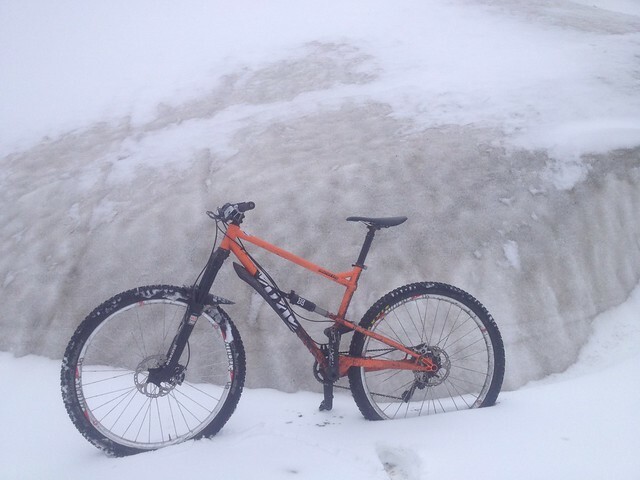 COTIC : news : THUNDERSNOWMAGEDDON! Well, we tried, but there's no way we're getting any frames out today. We have actual Thundersnow in Sheffield, and the Peak is a white out. Paul made it in to the warehouse, but there's so much snow coming down he's getting out soon. Cy can't even get out of Sheffield, and having spoken to the courier drivers neither can they. Really sorry if you have an order booked on this week. We're going to take a view on what is possible later today, but our feeling is that it will be Monday before we can get anything out, which will be delivery on Tuesday. In meantime, have a nice pic of Chay's Racin' Rocket at EWS La Thuille last summer.